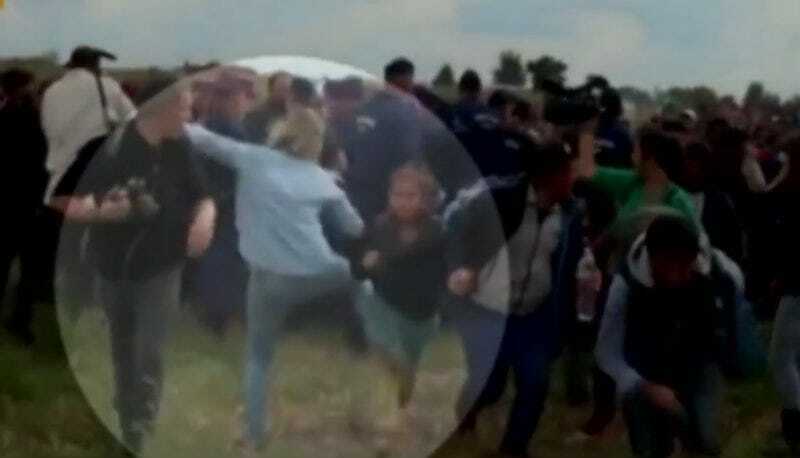 Earlier this week Petra Laszlo, a camerawoman for Hungarian news station N1TV, was filmed kicking and tripping refugees at the Hungarian-Serbian border. The refugees, largely from Syria, Iraq and Afghanistan, had broken through a police border, and were attempting to move through Hungary with the hopes of reaching Germany. As the refugees ran past Laszlo, she kicked a running child and later tripped a man carrying a small child. After the video of her kicking and tripping went viral, N1TV fired Laszlo. “Laszlo, who faces criminal charges carrying a sentence of up to five years in prison if convicted, went into hiding after bosses at N1TV, which is closely linked with Hungary’s right-wing nationalist party Jobbik, said she was detained by police Thursday but later released. Hungary has been criticized by other European Union nations for failing to help the refugees. The country’s right-wing government has repeatedly made anti-Muslim statements and, despite international pressure, has refused to yield.